Amazfit has proved its ability to release affordable gems like the long-lasting Amazfit Bip. Now, with the Amazfit Stratos, the company is taking its fitness trackers to the next level with a watch that features multi-sport support, V02max oxygen consumption measurements, and a partnership with Strava, among other inclusions that will please gym goers. Of course, the step up to the big league of wearables comes with a bump up in price over what we’re used to seeing with Amazfit. It retails at $199 (around AU$256), still a cheap price all said. In addition to all of the extra features, it possesses some design elements that we’re more used to seeing in a smartwatch. Since the US launch, we've also seen the product launch for the UK set in the middle of June where it's set to cost £145.99. That's a touch cheaper than what it costs in the US, but we've only seen it up for pre-order on Amazon so far. While not the most user-friendly option on the market, nor the most low-profile device, the Stratos is an impressively feature-rich wearable that undercuts the likes of Garmin and Polar with its sheer amount of activity support. 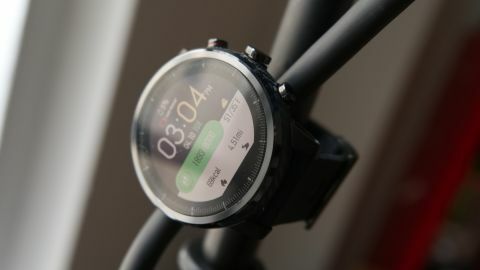 The Stratos ranks among Amazfit’s more expensive wearables at $199, and is available through Amazfit’s website in the US, as well as Amazon. If you’re outside of the US, we’ve seen Xiaomi (Amazfit maker Huami’s parent company – yep, it’s confusing) selling it direct through Amazon for £145.99. That won't be in stock until the middle of June though. We’ll be keeping a lookout for added availability elsewhere, but like Amazfit’s other wearables, the Stratos isn’t available everywhere. The Amazfit Bip looks quite similar to the Apple Watch until you take a closer look, but the Stratos asserts its smartwatch style throughout the presentation, both inside and out. Resembling a big, bulky first-generation Wear OS smartwatch, the Stratos wears its circular watch build proudly – it even has the flat tire-laden display infamously introduced by the Moto 360. Built with a ceramic bezel that surrounds its Gorilla Glass-covered top, the Stratos gives off an undeniably premium aesthetic that will catch the eye of smartwatch enthusiasts. But it offers more than just good design: encased stainless steel buttons and a carbon fiber-esque etching around its case, the waterproof Stratos is actually as tough as it looks. This thick wearable is surprisingly light at 70 grams, and its 1.3-inch touchscreen always-on display is quite large and is easy to read thanks to a contrast-heavy presentation and backlight, yet the viewing angles aren’t generous. For a fitness-focused wearable at this price, it’s tough to ask for something more streamlined than what the Stratos provides. But if you’re used to something like the Fitbit Ionic or the Apple Watch, this is going to feel monstrous. Thankfully, the Stratos yields a cozy fit, even when laced up tight enough to get an accurate heart rate reading – something we couldn’t say about the Amazfit Cor. Around the back of this fitness tracker is a heart rate sensor and charging port. While the former protrudes from the chassis quite a bit, it doesn’t impact comfort in the slightest and it might be the design call that helps this device get reliable heart rate readings. When it comes to actually using the Amazfit Stratos, those who are comfortable with smartwatch interfaces will likely be befuddled by what’s on offer here. Similar at times to Wear OS, it’s tough to get a sense of how you’re supposed to navigate Amazfit’s proprietary software at a given moment. Sure, the required Amazfit Watch app walks you through it, but you’ll likely need to practice for a few minutes before it feels somewhat natural. Even then, it’s still unintuitive for tech with a touchscreen. The button wrapped in red trimming is the power button, but it also acts to navigate backward in the user interface, which has 13 pages to sort through (though you can disable ones that you deem unnecessary through the Amazfit Watch app). Opposite from the power button, there’s another button that can navigate the other direction through the interface. Alternatively, once you hit the power button, which acts to unlock the watch, you can swipe with your finger – a much easier option. However, it will still likely take you over 5-10 seconds to perform the task you’re after. While working out, a whole other slew of controls are used to execute fitness-based tasks and while they make sense on paper, in reality they couldn’t feel more foreign. Using the touchscreen to navigate really is the easiest way to get around the Stratos, but that’s not the case when you’re working out. Difficult as it may be for those uninitiated to fitness watches, it pays to learn the button layout.